Welcome to the Healthiest YOU, a 10 Part Series to EMPOWER YOU to create HEALTHY HABITS and eliminate ones that compromise your health and well-being. Inflammatory foods can be confusing because they’re not a one size fits all. What’s inflammatory for your neighbour may not be inflammatory for you. Everyone is different! It all goes back to testing it out on yourself to determine which ones are inflammatory for YOU. That said there are foods and substances that are inflammatory for everyone and these include sugar, chemical/toxin food additives, hydrogenated oils and processed or fast foods. 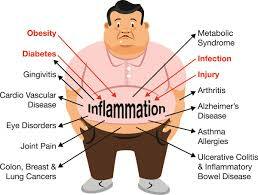 On the other end of the spectrum lie real foods, in their natural state that in some individuals create inflammation. For example, some individuals are fine with tomatoes and peppers where as others may experience skin rashes or even joint pain from eating them. In this series I’ll discuss the most inflammatory foods that are best to eliminate from your diet or eat them only very seldom. Let’s begin with the biggest culprit of all SUGAR & ARTIFICIAL SWEETENERS. This is a very common inflammatory food. From an overall health standpoint, the less you consume the better even if you feel like it’s not causing you inflammation. When reading the ingredient list be mindful of the different names for sugar: brown rice syrup, fruit juice, maple syrup, beet sugar, brown sugar, turbinado, evaporated cane juice, agave nectar, honey, dextrose, etc. Also, organic sugar has the same effect on your blood sugar as non-organic sugar. According to the World Health Organization females are to keep their sugar intake to maximum 6 teaspoons per day and males, maximum 9 teaspoons per day. Some artificial sweeteners should be completely avoided like aspartame and saccharin. All artificial sweeteners should be avoided, because they provide a sweet taste without any calories which causes the body to crave more sugar. A better option that will not raise your blood sugar and insulin is stevia and xylitol which some studies show that when they are consumed in their pure state and without additives they are non-inflammatory.